Two years ago at the Easter Vigil, I received a young man into the Catholic Church and confirmed him. A year later, he left a good job and became a FOCUS Missionary, serving at MIT. A year after that--yesterday, in fact--he married his high school sweetheart. It was a beautiful Nuptial Mass and a wonderful reception. Both the Mass and the reception were notable for their dignity and their beauty. At their request, the Mass was chanted. Friends of the couple sang in a choir. Ready for this? The congregation made all of the responses! The Mass was ten minutes late, but not because the bride was late. She was right on time. The Mass was late because all of the groomsmen piled into a tiny side sacristy along with myself, the Deacon, the Altar Boy, the Groom, and the Best Man. There, they all placed their hands upon Michael and began to offer prayers for him and Julia. One by one, they thanked God, praised God, and begged God to pour down abundant blessings upon the soon-to-be married couple. It was awesome. The eight year old Altar Boy, Peter, is the bride's nephew. The kid was an all-star. 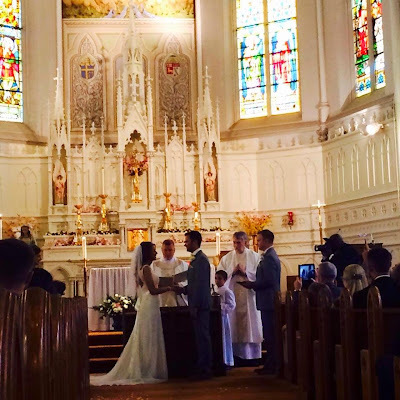 The couple prayerfully chose readings that had as a common theme dependence upon God. Sometimes when I preach at a wedding, I use the saint of the day or the liturgical feast as a starting point. Michael and Julia happened to be married on the feast day of St. Rita, a woman who wanted to be a nun, was forced into an arranged marriage to a wicked man, and prayed continuously for his conversion. After being stabbed by one of his enemies, the man died, but not before repenting from his sins. The prayers of St. Rita are credited with her husband's conversion. Thus, Rita is the Patroness of Impossible Cases. I enjoyed mentioning all of this in the homily. In the eyes of the world, marriage does seem like an impossible case. The words that Michael and Julia would speak to one another sound impossible. "I will love you and honor you, in good times and bad, for richer for poorer, in sickness and in health, until death do us part." Some days, that will seem impossible. Isn't it great that the Lord provided them a special patroness to help them when they become deceived into thinking that it is truly impossible to live that vow? Additionally, Michael and Julia were married between the Solemnity of the Ascension and the Solemnity of Pentecost. In the Ascension, our Lord shows us that He has bestowed upon us a destiny and a mission. He has destined us to live with Him forever--body and soul--in the Glory of Heaven. This sounds too impossible to be true! It also sounds too impossible for us to achieve! And it is! None of us can achieve this destiny on our own efforts or natural goodness. We are entirely dependent upon the Lord and His Grace. In addition to this destiny, the Lord bestowed a mission. He calls Michael and Julia to go out and make disciples of all the nations. By the way that they love one another, they will be witnesses to Christ's Love for His Bride, the Church. Michael and Julia reminded all of us yesterday of our destiny and our mission. To achieve this destiny and to live our mission, God pours forth the Holy Spirit upon us. The Holy Spirit makes what is impossible, possible. He makes sinners into saints. He transforms bread and wine into the Body and Blood of Christ. And in the Sacrament of Marriage, He takes a man and a woman and transforms them into an icon of Christ and His Bride, the Church. Michael and Julia entered into something magnificent yesterday. The Sacrament that they received will help them to do the impossible. Through the Sacrament of Marriage, they will be able to help one another to attain their God-given destiny, eternal life. And through the Sacrament of Marriage, they will help each other to fulfill their mission of drawing all souls to Christ. Praised Be Jesus Christ! So often in the Scriptures, heaven is described in terms of a banquet. Michael and Julia's reception was most definitely a reflection of what the Nuptial Banquet of Eternal Life must be like. It was so striking to walk around that room and meet so many good people. The room was filled with men and women of extraordinary goodness. 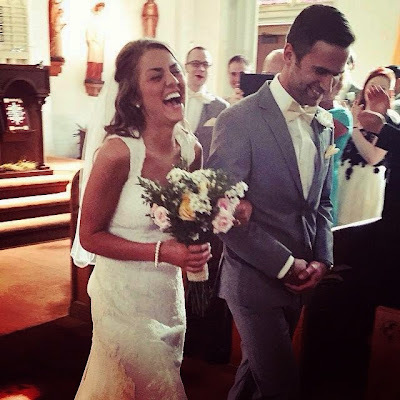 There were FOCUS Missionaries, young college students who have met Mike and Julia through FOCUS, seminarians, and hosts of young couples who are raising their children in the life of the Gospel. There was a holy joy that marked the entire reception. Really, I kept thinking, "This must be what heaven is like." When people love one another in Christian love, God does something truly magnificent. Along the way, Michael and Julia met FOCUS Missionaries and, as Michael once told me, "They changed my life." And Michael and Julia are changing the lives of others, drawing them towards their destiny, and setting them afire with the mission of making disciples. Evangelization MUST begin in friendship and in love. It is sustained through friendship and love. It is ordered towards friendship and love. Heaven is eternal friendship and love. If we depend upon ourselves, our destiny and mission are truly impossible. But with God, all things are possible. I am grateful to FOCUS and to Michael and Julia for giving us all a glimpse into what our destiny is and why our mission is such a joyful one. Congratulations to Michael and Julia, what a wonderful witness to the love of Christ!